The U.S. job market has improved over the past year, but it is still not fully recovered. That was Federal Reserve Chair Janet Yellen's main message Friday in a much anticipated speech. "It speaks to the depth of the damage that, five years after the end of the recession, the labor market has yet to fully recover," she said. Though the unemployment rate "has fallen considerably and at a surprisingly rapid pace," Yellen said problems remain. "A key challenge is to assess just how far the economy now stands from the attainment of its maximum employment goal," she said. 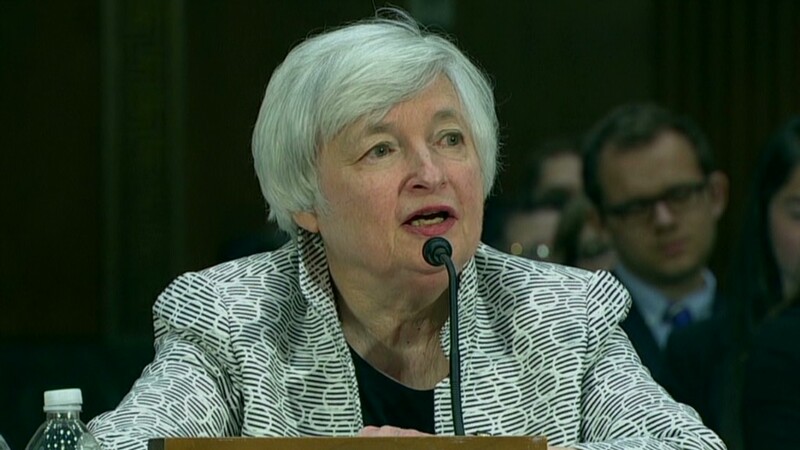 She and some other policy makers remain hesitant to pull back on the Fed's economic stimulus campaign and raise interest rates until the employment landscape improves further. Among her main concerns are the decline in the number of people participating in the labor market, the jump in those working part-time because they can't find full-time positions, the ranks of the long-term unemployed and the lack of wage growth. At top policymakers' most recent meeting, they decided to stay the course on rates "for a considerable time" after its monthly bond purchase program ends in October. But Yellen did leave the door open to speeding up the time line if the job market continues to improve more rapidly than expected -- or if inflation becomes an issue. Related: Median income is on the rise ...finally! In her speech, she took another step in shifting the discussion to "when" the board will raise rates, not "if," said Paul Edelstein, director of financial economics at IHS Global Insight. Those who watch the Fed closely predict a rate hike is likely to come in the summer of 2015. Timing is crucial since a change in rates -- particularly an unexpected one -- could have a major impact. "If they move too quickly, they snuff out the economic recovery," said Kathy Bostjancic, a director at Oxford Economics. "If they are late to the game, then you have an undesired rise in inflation. That would force the Fed to raise rates abruptly, disrupting the financial markets and economic growth."